Dean Guedo, defensive backs coach of our Senior team has been named the Head Coach of the W.P. Wagner Warriors. WP Wagner is a High School that plays in Division II (Miles Conference) in Edmonton Metro Football. Bulldogs Football would like to wish Dean good luck in his new position and congratulations..
Read the news article below to see how one of the true gentlemen of our community was recognized last week. This community service award recognizing Larry Olexiuk ('Coach O' as he is fondly known as around football) is incredibly deserving. Larry is a man who personifies a selfless pursuit to better the sporting environment for our youth. To have had the opportunity to know him and work with him is truly a pleasure. He is relentless in helping not only sporting activities, but is involved with many community based ventures. I know we at Bulldogs Football are forever indebted to his dedication to these 1000's of kids he has helped along the way. Larry is a mountain of a man in every sense of the word, and a pillar of our community. 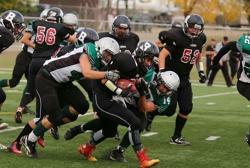 The second annual ABC Rising Stars Border Bowl is being played on Saturday, May 24 at 3:00 in Lacombe, AB. This game pits top High School players from Grade 10 and 11 outside major centres against their counterparts in BC. Last year at the very first ABC Border Bowl the BC All-Star team squeeked out a narrow victory over the Alberta team in Kelowna. This years game is in Lacombe at the Lacombe Athletic Park 5644 - 56 Avenue. Six Bulldogs are playing in the game: Seth Waselenchuk, Tyler Feltis, Nick Cowan, Andrew Johnson, Brandon Trelor and Ben Bochar. St. Albert Senior Bowl Players, Hanna, Moroz, Turner, Neuls, Knott. OUR THREE ALL-STAR PLAYERS FROM BELLEROSE BULLDOGS TOOK PART IN THE 25TH ANNUAL SENIOR BOWL GAME AT COMMONWEALTH STADIUM ON MONDAY, MAY 19TH. 2160 FANS, EASILY THE MOST TO EVER ATTEND A SENIOR BOWL WATCHED A VERY EXCITING AND ENTERTAINING GAME. IN THE END, OUR NORTH TEAM DEFEATED THE SOUTH, 14-10. OUR OWN BULLDOG PLAYERS HAD AN EFFECT ON THE GAME WITH JACK HANNA MAKING 4 TACKLES AND BEING NAMED "MOST VALUABLE LINEMAN" FOR THE NORTH TEAM. TYLER MOROZ HAD 4 TACKLES PLUS AN INTERCEPTION THAT SNUFFED OUT A LONG DRIVE BY THE SOUTH TEAM IN THE THIRD QUARTER, AND JACOB NEULS HAD A HAND IN 3 TACKLES ON THE DEFENSIVE LINE. ALL THREE PLAYERS WILL CONTINUE THEIR FOOTBALL CAREERS IN 2014 WITH JACOB NEULS JOINING THE UNIVERSITY OF ALBERTA GOLDEN BEARS, WHILE JACK HANNA AND TYLER MOROZ HAVE BEEN INVITED TO PLAY FOR THE EDMONTON HUSKIES IN THE PJFC. CONGRATULATIONS TO THESE OUTSTANDING BULLDOGS PLAYERS. 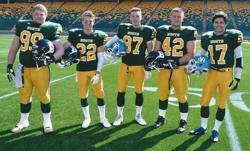 FOOTBALL ALBERTA 25TH SENIOR BOWL WILL TAKE PLACE ON MONDAY, MAY 19TH, NOON AT COMMONWEALTH STADIUM. TICKETS ARE $10.00 EA AT THE DOOR. THIS YEAR BELLEROSE BULLDOGS HAS 3 PLAYERS PARTICIPATING IN THE GAME. FOR THE FIRST TIME EVER, THE GAME WILL BE BROADCAST ONLINE COMPLETE WITH AN ON-SCREEN SCOREBOARD AND INSTANT REPLAYS. THERE WILL BE PLAY BY PLAY ANNOUNCER AND COMMENTARY. TO WATCH THE GAME ON MONDAY, CLICK ON THE LINK. BREAKING NEWS! BULLDOGS INK FUTURE STAR! CONGRATULATIONS TO JUNIOR BULLDOGS COACH CRAIG DRYER AND HIS WIFE KYLIE ON THEIR NEW BABY BOY (AND FUTURE BULLDOG) CONNOR KENNETH DRYER!!!! BEAMING GRANDPARENTS ARE COACH BUCK DRYER AND TEAM TREASURER CHERYL DRYER ALONG WITH UNCLE/COACH BRADY DRYER! Dean Ciampanelli signs to go to Mount Allison University in New Brunswick. Football Canada is proud to announce its Junior National Team roster which will take on USA Football’s U19 National Team as part of the 2014 International Bowl series, to be played February 7-8 at Maverick Stadium at the University of Texas at Arlington. The full roster can be found here in addition to being listed below. The 60 player roster was selected from close to 500 players who took part in regional identification camps across Canada. These top prospects will take on USA Football’s U19 squad in Texas, competing for one of 45 spots to represent Canada at the 2014 U19 (19-and-under) World Championship in Kuwait. Canada’s 2014 Junior National Team is led by head coach and defensive coordinator Warren Craney. Craney is a veteran of international competition having served as defensive coordinator at the two previous World Championships under Noel Thorpe (2012) and Glen Constantin (2009) respectively in addition to four generations of the IFAF World Team. Canada and Team USA have met in the first two IFAF U19 (19-and-under) World Championship gold medal games with Canada avenging a 2009 loss in 2012 to capture gold. With the record split, the 2014 International Bowl series will re-ignite the Canada-USA rivalry as it builds towards the summer. The International Bowl series features a number of Canada-USA rivalry games which in addition to a Junior National Team showdown includes the Football Canada Cup (U18) National Team against USA Football’s U18 National Team. Canada’s Junior National Team alumni include Byron Archambault (U. Montreal), Linden Gaydosh (Carolina Panthers), Pierre Lavertu (U. Laval), Kirby Fabien (BC Lions), Will Finch (Western U. 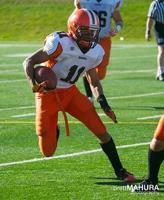 ), Steven Lumbala (Montreal Alouettes), Jeremi Roch (U. Sherbrooke), Matt Sewell (McMaster U. 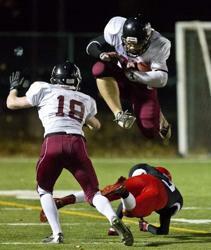 ), Mercer Timmis (U. Calgary) and Jake Thomas (Winnipeg Blue Bombers). Here is the listing of the special Black Bulldogs Football jersey's that are available for anyone to purchase. if you wish to own one of these jersey's please contact DARRYL MOROZ AT info@bulldogsfootball.ca or 780.498.1837 to lay claim to your own limited edition Bulldogs Football Black Jersey.